Visual Communication With Customers and Employees! Drawings in cleaning planning are very effective when it comes to showing customers and staff the functions planned for the individual rooms. And, the drawings may also be used to create a quick overview of your space inventory and to discover and correct any errors. Measuring of drawings is the quickest way to get a total overview of all your rooms and their sizes. There will then be no need for you to physically measure all the rooms by pen and scale, or by walking the facility and you will get precise areas on all your rooms, regardless of their sizes and forms. MEASURING Access to measuring cleaning areas via drawings. The drawings may be entered into the system via a digitizer (drawing board) or be drawn by hand. The drawings can be measured and adjusted to fit each individual room, i.e. by cutting out floor space not being cleaned (gross/net space), division of rooms into several room parts, drawing of round walls, free-hand drawing, and adding fixed symbols and optional positioning/adjustment of text for each room. ZOOM, SCALING, ROTATION, AND DISPLACEMENT Optional zoom of drawing. Auto-zoom function which automatically adjusts the zoom relation so that all rooms can be seen on the screen at the same time. Scaling of drawings measured in the wrong scale. 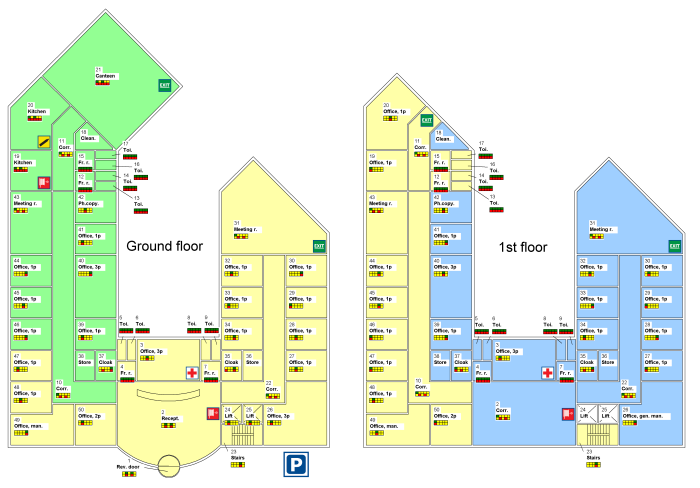 Rotation and hiding of drawings allows more floors and buildings to be shown on the same diagram. AREA DISTRIBUTION Distribution of work assignments, week distribution, service profiles, cleaning profiles etc. directly on the drawings. IMPORT/EXPORT OF DRAWINGS Input of JPG/GIF-files, as well as DXF files from AutoCad, MicroStation and similar systems. Export of drawings in several formats, including PDF-format.